Our afternoon one-tank dive out of Freeport Bahamas takes you to one of the many thriving coral reef gardens located just a few miles off our shores. This afternoon dive is perfect for scuba divers on a tighter schedule looking to do a short one-tank dive. Our destination varies day by day, as we have over 15 different reef sites that we go to, depending on the conditions on that day. But you can be sure that whichever reef we go to, you will be swimming among a lively and colorful marine ecosystem made up of hundreds of different coral reef species including both soft and hard corals, at depths ranging from 30 to 60 feet. The Bahamas are known for their excellent scuba diving opportunities, not only thanks to the area’s proximity to amazing coral reef sites, but also thanks to the year-round warm and clear waters of the Bahamas. 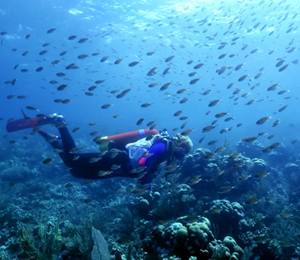 Scuba divers from all over the world come to the islands of the Bahamas just for scuba diving. Now is your chance to experience this world-class scuba diving with our top-notch Freeport scuba diving trips! We work with a talented, professional, and dedicated team of scuba instructors that will be sure to take you to the best spot based on the day’s conditions in order for you to experience the most unforgettable scuba diving in Freeport experience possible. Transportation is not included with this activity. No, unfortunately only divers may come on this trip. With all the media hype it's understandable why people often ask this question but the truth is that unprovoked shark attacks are very, very rare and attacks on scuba divers are even more rare. Our staff, divers and dive masters are all trained in making sure your dive is safe and enjoyable. What is included with the diving? What Equipment Can I Rent? Available for rent are Masks / Fins / Snorkels, BC's, Regulators. Wetsuits, Computers and Digital Cameras. I have been to the Bahamas many times, but Freeport One Tank Afternoon Dive is one of my favorite trips! It includes everything that everyone should do here. As a Bahamas veteran, I can say only the best about this experience!